The new facility is comprised of 31 classrooms, two large computer labs, a 350-seat auditorium, break-out spaces for undergraduate, graduate and executive education student groups, desktop Internet access in every classroom, wireless network access throughout, audiovisual and online learning support in every classroom, conference rooms, and office space for all 96 of the school's faculty members. Profile: The building stands as a gateway to the University of Texas at Dallas campus and includes features that were designed to facilitate the teamwork approach favored in business education. 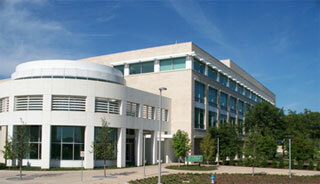 The new state-of-the-art facility allows all of the school of management's operations to be housed under the same roof. The building features classrooms with modern equipment, wireless connectivity, videoconferencing facilities, two computer labs, and faculty and staff offices, meeting rooms, as well as a separate executive education center, in addition to a 350-seat auditorium. The building was outfitted with wireless communications links, making it even more convenient for students and faculty to access important resources.